Use a marker not a regular pen. 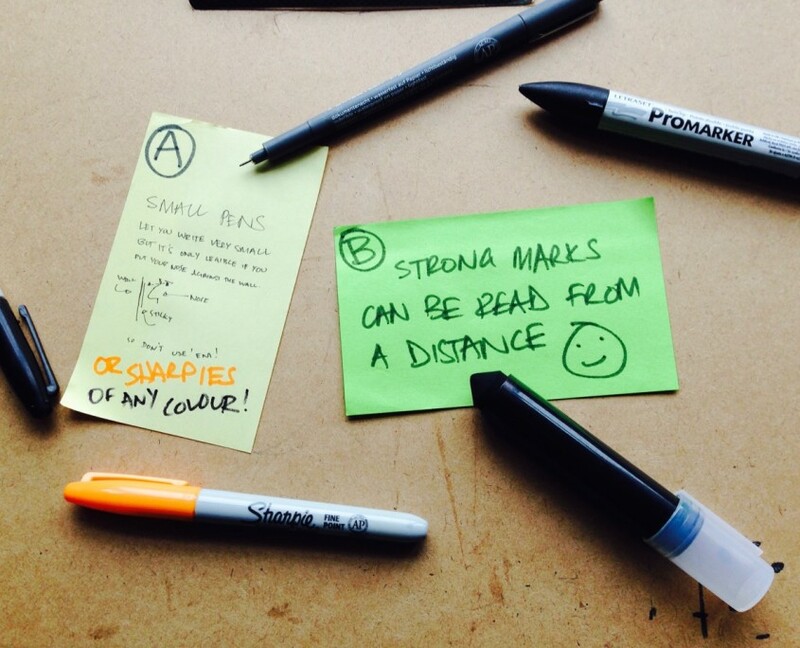 Little pens lead to little text and – unless you have x-men sight skills – unreadable at a distance. Don’t do it. Do however choose the right marker. Sharpies are ok but I don’t use them as much anymore as they tend to bleed through the paper and onto the next sticky underneath. I also painted our workshop space with whiteboard paint or use a lot of whiteboard space so again, not a smart move to use a permanent marker. And don’t get my started on the fashion faux pas of getting markers on my clothes. Not all of us have free vendor wear t-shirts. 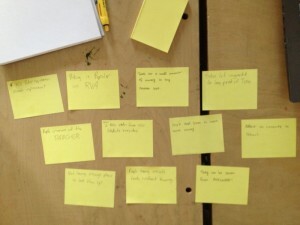 There is also an alternative to sticky notes – Stattys. Stattys are static cling, so no stickiness. I love these as you can slide things around at will and they stick to surfaces the sticky notes have trouble with. I’d say the biggest downside is that they do smear a lot more so you have to be careful when writing and placing them to start with. Once they dry it’s all good.